Do you want to watch your favorite TV series or movie for FREE? Have you heard of iflix? If you have not yet heard or try it then you should because they are giving away 4 MONTHS FREE SUBSCRIPTION to their services this weekend. iflix enables you to have access to tons of huge selection of your favorite tv shows - thousands of tv shows plus movies, anime and more worldwide. Imagine watching shows from Hollywood, Hong Kong, Seoul, Shanghai, Thailand, Tokyo and more whenever you want, wherever you want, 24/7 on your phone, laptop, tablet and TV. How do you avail the 4 month free subscription? 1. Register for a free 30-day trial at iflix.com. 2. Go to ToyCon 2016 at SMX Convention Center. 3. Visit the iflix booth at ToyCon 2016 and receive an additional 3 month subscription. Aside from that they will also have a photo booth available. 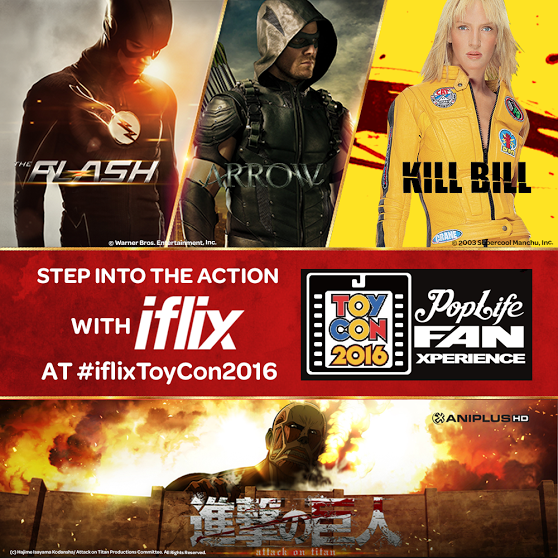 Take your photos with Kill Bill, Flash/Arrow and Attack on Titan as your backdrop. Enjoy great tv shows and movies!